National Investor Relations Institute President and CEO Jeff Morgan follows up on Warren Buffett’s public comments about communicating with investors (see “Buffett takes a poke at IR”) today in NIRI’s IR Weekly e-newsletter. The Berkshire Hathaway CEO, you may recall, told CNBC in a recent interview that as an investor he doesn’t need to be “schmoozed.” And he’s sympathetic with CEOs who don’t like meeting with analysts or investors. Buffett does his annual letter to shareholders (which I’ve often noted is enlightening and entertaining), and he and Charlie Munger answer questions for hours at their annual meeting. Beyond that? Contrary to what IR people advise, as Buffett describes it, “I don’t think it’s important to schmooze investors.” In his 2010 shareholder letter, he boasts that top managers enjoy working for Berkshire in part because they’re “not subjected to … Wall Street harassment” – that is, meeting with investors or analysts. While his comments may have surprised you, Mr. Buffett considers the IR function to be very important, indicates Cathy Baron Tamraz, Chairman and CEO of Business Wire (a Berkshire Hathaway company), so much so that Buffett is Berkshire Hathaway’s primary IR contact. Cathy told me that Mr. Buffett’s core principles are that all investors (no matter the size) be treated the same, and they should all have the same access to information and the C-Suite. Mr. Buffett is in the unique position to do this largely through his candid and thorough annual report and the time he spends on Q&A at his annual meeting. OK … I’m cool with the egalitarian ideal. In theory at least, the retail owner of 100 shares (or maybe one share, in Berkshire’s case) is as important as an institutional holder of 100,000. But Buffett tells CNBC the annual meeting and report are really his answer to IR. “I spend no time, for example, with any specific analyst,” he says. I really have no quibble with Buffett (not that the opinion of a flea would matter to a giant, anyway). My concern is that CEOs and CFOs of companies across America should not take Buffett’s dismissal of standard practice in investor relations as the standard for all companies. Small and medium cap firms, especially, will hurt themselves if they shun contacts with investors. Published information may often be supplemented to an important extent by private inquiry of or by interview with the management. There is no reason why stockholders should not ask for information on specific points, and in many cases part at least of the data asked for will be furnished. It must never be forgotten that a stockholder is an owner of the business and an employer of its officers. He is entitled not only to ask legitimate questions but also to have them answered, unless there is some persuasive reason to the contrary. I know disclosure has changed since Graham – we have all these laws like the ’33 and ’34 Acts, Sarbanes Oxley and Reg FD – but I still like his reminder of who the owners are. And if it means employing an IRO or two to talk to investors, so be it. What’s your opinion? Interesting comments on the prior post – feel free to weigh in. Some folks in the investor relations community are bothered – even angered – by Warren Buffett’s recent verbal jabs at IR people and the profession as a whole. March 15 Update: a few additional thoughts here. Maybe I’m thick-skinned. I don’t think we need to feel threatened by what the CEO of Berkshire Hathaway says about IR. Nor should we see the Oracle of Omaha as some sort of, well, oracle. He’s one CEO. We must look closely at our companies and CEOs, challenge conventional thinking, and decide what makes sense in IR. I spend no time, for example, with any specific analyst. We spend all the weekend of the annual meeting, you know, we’re there to answer questions for hours and hours and hours, and I try to answer all questions that I think are important than I can think of in the annual report. But I have never sat down — I never sit down with a big investor. They write and say, you know, `We own $500 million worth of stock, you have to sit down with us.’ And I say, listen, I’m not going to sit down with you … as far as I’m concerned, one share of me owned by some … woman in my neighborhood is just as important as yours. … But most managements kowtow to large investors. In fact, they call me — some of the things we own, they call me and they want to come from thousands of miles away to talk to me. And I say listen, if I need to talk to you, I shouldn’t own your stock. I mean, I don’t — I don’t need to be schmoozed, you know? I mean — and the investor relations guys hate that because their job is dependent on, you know, making the boss feel it’s very important to go around and stroke these big investors. But I’m not looking for that. And I would say that most managements don’t enjoy it, and … they do spend a significant part of time when I would rather have them out there figuring out ways to cut costs or sell more goods or whatever it may be. And our managers do not have to spend any time on that sort of thing. It’s a function of succumbing to what investor relations people and Wall Street generally tells you is important. I don’t think it’s important to schmooze investors. I think in the end you get a class of investors — what you want is people that understand you and your business and what you’re about. … And the idea of trying to cultivate new people all the time, you know, there’s only so many seats in the church. And at Berkshire, in terms of the A stock, we have a million, 600 and some thousand seats. The only way a guy gets a seat is for somebody else to leave. I’d rather keep the person that’s there than to try and induce somebody else … go out a thousand miles on a trip and tell them, you know, things are wonderful and sort of dodge around the problems of the business. I’d much rather … keep the person that’s there already, have people that know and understand Berkshire, and not look for a revolving door constituency. Data support the value of effective IR. For example, surveys of buy side investors say good IR boosts a company’s valuation up to 10%, while bad IR hurts as much as 25%. Increased sell side analyst coverage lowers the cost of capital. And issuing news more often benefits liquidity for shareholders. It seems arrogant for Buffett, in his annual report, to describe management meetings with investors as “Wall Street harassment.” I’m uncomfortable with the way he views the basic activity of communicating directly with shareowners. Buffett dismisses IR as “schmoozing,” telling investors “things are wonderful” and dodging difficult issues. More often, I see investor meetings as management being willing to face tough questions. And I’ve talked with many investors who say watching the CEO or CFO answer and getting a sense of confidence (or doubt) is a key discipline in making investment decisions. Road shows can wear on a CEO. I know I’ve sat in limos after long days of meetings and heard CEOs complain that they could be back running the business, doing what they value and enjoy. Part of the strategy for an IRO is to structure productive meetings, even enjoyable activities, for our executives – and to spread the time commitment around if possible. Of course, Buffett is so widely revered – as an investor and CEO, mostly the former – that he’s earned the right to do it his way. I would argue he really does practice IR: There he is on CNBC, his witty shareholder letters are a brand of their own, he speaks out regularly to support his holdings’ interests, his annual meetings are a capitalist Woodstock. Berkshire Hathaway is part public company, part mutual fund and part personality cult. I admire Buffett in many ways, including his IR messaging, but we are not him. Most of us work for companies operating in a more earthly realm. We need to tell our stories if we want investors to know us at all – or understand us. We need investors to see our top managers and have confidence in their ability. And we need to build relationships – with current shareholders, those who might invest in the future, and even the sell-side analysts who advise their own sets of clients. What’s your feeling about Buffett and IR? Warren Buffett’s latest letter to shareholders of Berkshire Hathaway, posted Saturday, rewards the reader with pithy quotes on nearly everything in business, as have so many of his annual reports in the past (a 34-year archive is here). Most of us wouldn’t suggest that our CEOs write a 25-page shareholder letter, but neither do we work for a cultural icon nicknamed “the oracle of Omaha.” Most of the time I think Buffett speaks more from self-interest than from revelation, but what he says – and how – bear examination by everyone engaged in investor relations. Explaining the business is at the core of Buffett’s 2010 Chairman’s Letter, just as explaining the business should be the heart of every IR presentation or report. But not just the business – this letter works to explain the “secret sauce” that makes Berkshire Hathaway Berkshire Hathaway. The secret sauce isn’t secret, of course. It’s what makes a company different from – better than – anyone else around. This is not likely to be obvious from a glance at the income statement and balance sheet. But in Berkshire Hathaway’s case it is really a financial story, which Buffett lays out in between those quotable quips on everything else. Berkshire Hathaway is basically an investment company. It held $158 billion worth of stocks, bonds and cash instruments at year-end. The secret sauce, apart from the legendary instincts of Buffett and Charlie Munger, is the interest-free financing for more than one-third of those investments. Buffett explains: “Insurance float – money we temporarily hold in our insurance operations that does not belong to us – funds $66 billion of our investments. This float is ‘free’ as long as insurance underwriting breaks even, meaning that the premiums we receive equal the losses and expenses we incur.” Figure the income on $66 billion, and investing the cash for those insurance companies becomes very profitable. Second, Berkshire Hathaway owns 68 non-insurance companies – businesses Buffett and Munger have fallen in love with and decided to marry – and these operating companies generate earnings. Over 40 years, the pretax earnings of those companies has grown at a compounded 21% rate; the value of those earnings is quantifiable. Buffett explains, somewhat persuasively, that the operating companies benefit from good managers who love running those businesses and from a pervasive owner-oriented culture. The secret sauce? The operating businesses aren’t limited in reinvesting the cash they generate – they’re part of Berkshire Hathaway. A typical furniture store chain, let’s say, would feel compelled to plow earnings back into the furniture biz. But Berkshire Hathaway can allocate cash thrown off by Nebraska Furniture Mart into a railroad … or the stock market, or T-bills … whatever looks promising. Finally, Buffett cites a more subjective source of value: the company’s ability to deploy today’s retained earnings into investments that earn good returns in the future. While nearly every company accumulates retained earnings, he says, “some companies will turn these retained dollars into fifty-cent pieces, others into two-dollar bills.” And the secret sauce? Well, it comes back to Buffett and Munger, plus some younger investment guys they’ve brought in to carry on after Warren and Charlie are no longer around. I assume shareholders will increasingly ask for tastes of these newer versions of the investment sauce. We should each think about our companies’ secret sauce. Is our financial structure geared to create higher ROE? Are assets minimized to boost ROA? Do we get 2 cents per transaction, times a billion transactions, with volume growing daily? Do we have a brand or intellectual property that can’t be matched for years to come? We need to have our CEOs analyze – and explain over and over – our secret sauce. Meanwhile, the Omaha oracle and his long-time partner are carrying on. The letter defines growing book value as a metric for success, a proxy for Benjamin Graham-type intrinsic value. It walks shareholders through what’s happening in each of the key businesses. Explains the rationale for the big M&A deal of 2010: BSNF Railway. And comments on the business environment and stock market. All worth reading. 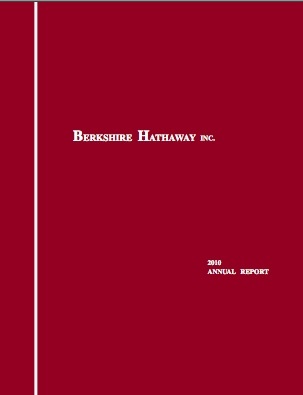 The 2010 annual report of Berkshire Hathaway, of course, has financial tables and footnotes and an MD&A – even a cover. But every year, the way Buffett explains the business makes his shareholder letter the star of this show. If you’ve wondered what the Berkhshire Hathaway annual meeting is like – from parties to steakhouses to sightseeing in Omaha to asking “the Oracle” a question, Mattathias Schwartz offers a first-timer’s view of the pilgrimage to capitalism in the January 2010 Harper’s Magazine. 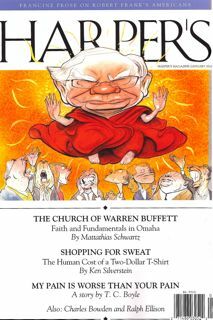 “The Church of Warren Buffett” (online access limited to subscribers) is an entertaining, if somewhat cynical, look at the phenomenon of BRK and its loyal shareholders – though it falls short of real insight into either Buffett’s investing approach or the relationship of the company with its investors. Charlie and I hope that you do not think of yourself as merely owning a piece of paper whose price wiggles around daily and that is a candidate for sale when some economic or political event makes you nervous. We hope you instead visualize yourself as a part owner of a business that you expect to stay with indefinitely, much as you might if you owned a farm or apartment house in partnership with members of your family. For our part, we do not view Berkshire shareholders as faceless members of an ever-shifting crowd, but rather as co-venturers who have entrusted their funds to us for what may well turn out to be the remainder of their lives. Now that’s targeting long-term investors. More CEOs could express those feelings. This year’s Berkshire meeting will be Saturday May 1, with parties all weekend. But you can save the plane fare to Omaha, and the cost of BRK.A or BRK.B shares, by picking up the magazine. Or just spend an hour exploring Berkshire’s website. Ultra-plain in presentation, matching the cultivated down-home-ness of Buffett himself, the site offers a wealth of interesting reading and philosophy on investors.